I think every Jeep owner has experienced this. Late Sunday afternoon, I sat behind the wheel of the Jeep in my garage. 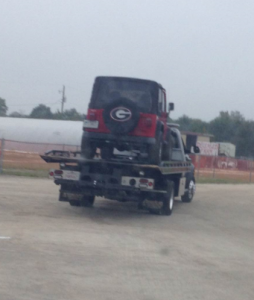 The day started by meeting a tow truck driver back at the corn maze to retrieve the disabled Wrangler. After a trip into town for what I hoped would be my only trip of the day to the auto parts store, I ate lunch. With lunch over, so was my stalling, and I trudged to the garage to begin the water pump replacement. I took my time and only had to reference YouTube a couple of times. Four hours later, the time had come. I put the key in the ignition and pressed in the clutch with my left foot, pausing for one last mental review of the procedure. Here goes nothing, I thought and turned the key. The Jeep fired right up. I shifted the transmission to neutral, slid out of the driver’s seat, and examined my work with the engine running. Unlike the night before, the new water pump was silent and that was good. Thanks to a new serpentine belt, the little bit of belt squeal we had before was gone, too. The radiator fan did not fly off and put a hole in the radiator. That was great. I checked for antifreeze leaks, and seeing none, put the hood down. Next, I drove around the neighborhood and returned to the garage. Once again, I lifted the hood and checked for leaks. Still none. I let the engine cool and, as a final step, topped off the radiator’s antifreeze. The job took longer than I wanted, mostly due to my rusty mechanic skills, but I didn’t create any new problems or have to make a second trip to the parts store. My back and shoulders ached from being bent over the engine bay all afternoon, but the oncoming flu probably had something to do with it, too. As I cleaned up my mess, I had a triumphant feeling of satisfaction. Before tackling this repair, I considered making this a father-son project. I decided not to do this for a couple of reasons. First, as I mentioned earlier, I was a bit out of practice and expected the repair to take a while. If I was taking the time to teach, then the job would be even longer. Also, this was not a beginner repair. I’m still working on teaching him how to do an oil change. This was too advanced. Afterwards, I did take the time to show my son how to check the antifreeze level and top it off, if necessary. We put two gallon jugs of antifreeze in the Jeep’s trunk compartment, just in case. Finally, I made sure he knew to keep an eye on the dash temperature gauge. It was 1992. My wife and I lived in an apartment complex just south of Dayton, Ohio. 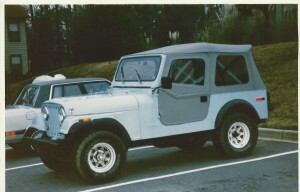 Most apartment complexes frown upon tenants doing auto maintenance, but my newly acquired 1979 Jeep CJ-7 (eventually nicknamed P.O.S 1 by my wife) had a clunking noise in the transfer case when making tight turns. In a four wheel drive vehicle, the transfer case is the mechanism that provides the four wheel drive. The recommended fix for this was to change the transfer case oil. Simple enough. Just drain the old and fill with new. I decided to tackle the repair myself. What could possibly go wrong? The drain plug looked to be right above a hole in the skid plate, which is a rectangular piece of steel attached to the vehicle’s frame. The plate provides protection for the transmission and transfer case and also serves as support for these components, which are bolted to it. I put my bucket underneath the hole and removed the drain plug. Stinky, chocolate milk colored fluid flowed from the transfer case. Much to my surprise, though, no oil came out of the skid plate hole above my bucket. Instead, oil flowed out three other holes and onto the parking lot. I had either parked on a slope or misjudged the hole’s alignment. Doah. It is amazing how two quarts of transfer case oil can look like the Exxon Valdez spill when poured on an asphalt parking lot. Guess that’s why apartment complexes don’t want you to do maintenance. I cleaned up the best I could. Turns out the new oil did not solve the clunking problem. Eventually, I had some good old boys from the hills of Pickens, South Carolina fix my transfer case. I should have quit then, but I persisted at Jeep and auto maintenance. Eventually, I created an even larger oil spill in the driveway of my first house, but that’s an adventure story for another day. You can get yourself a set of BFG Mud Terrains, Good Year MT, Cooper Discoverer MT, ProComp MT, there are many more to chsooe from. ,Also, 30 9.5R15 s will fit with no problems. 31/10.50LT15 will fit too but you will experience some fender rubbing on a flexy trail, the 30 s not as much. Of course your speedometer will be off (slower) by up to 6% due to the larger diameter tire. Meaning that if your speedometer is reading 55 MPH, your actual road speed will be about 52 MPH.